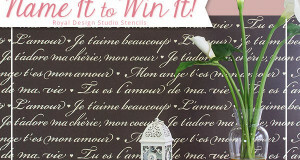 Home / News / Contests + Giveaways / New Moroccan Stencil: Name it to Win it! New Moroccan Stencil: Name it to Win it! Post Update: This contest in now closed. The winning stencil name was Sultan Swirl Wall Stencil suggested by Tamra Alexander Cook. Find the Sultan Swirl Wall Stencil on Royal Design Studio. Check back on our Stencil Contests page often for your chance to win! Moroccan design décor is bold, colorful and timeless. Its blend of African, Arabic, Berber and European influences makes it a classic decorating style that transcends trends and adapts to all tastes. That is why it’s not very surprising that many of our most popular stencil designs come from our beautiful Moroccan Stencil Collection! 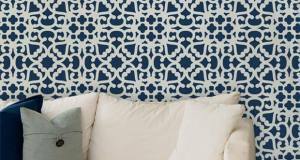 We’ve recently added several new designs to this collection, including the ornate Mughal Trellis stencil series that was designed for Melanie Royals’ latest painting trip to Marrakech. This Moroccan stencil pattern shown above was also used, yet has left us searching for the perfect name. That’s where YOU come in! Leave your stencil name suggestion in the Comments below before midnight on Sunday, June 8. If we chose your name we will send you the stencil. Good luck! Note: To prevent spam on our site, all comments need to be approved. Don’t worry if you don’t see your comment right away!